You only get one chance to make a first impression. 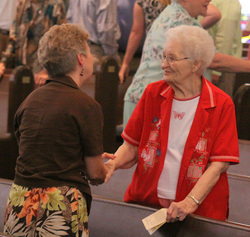 It is our hope that every person who comes to be our guest at Centre First United Methodist Church is warmly welcomed. The first person you meet can dramatically impact the way you feel about the rest of the worship experience. If you would like to serve as one of our greeters for either the 8:45 or the 10:55 service please contact the church for a training opportunity!